Description: The small schooner Maid of the Mist encountered a strong gale off Huron Beach while awaiting a load of cedar posts. 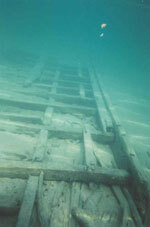 The ship dragged anchor, grounded and broke its keel. 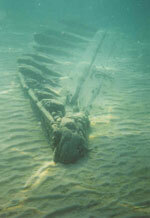 Its wreckage consists of three sections including both sides and the bow buried deeply in the sand. Port side showing railing and interior frames.